Steel is an alloy of iron with about 1 percent carbon. It may also contain other elements, such as manganese. Whereas pure iron is a relatively soft metal that rusts easily, steel can be hard, tough, and corrosion-resistant. Used to make almost everything from skyscraper girders, automobiles, and appliances to thumb tacks and paper clips, steel is one of the world's most vital materials. Among all the metals, iron is second only to aluminum in natural abundance, making up 4.7 percent of the earth's crust, and occurring mainly as its various oxides. The main product made from iron is steel, the least expensive and most widely used of all metals. It appears that ancient peoples were using iron as early as 4000 B.C.E. for making various tools, weapons, and other objects. They apparently obtained the iron from meteorites. The composition of those earliest iron artifacts was higher in nickel than native iron ores on Earth, in keeping with the composition of meteorites. In fact, the word "iron" comes from an ancient term meaning "metal from the sky." It is interesting to note that when Admiral Robert Peary visited Greenland in the 1890s, he found that the Inuit had for many years been making iron tools from a 30-ton iron meteorite that had fallen there centuries earlier. While it is not known exactly when people learned how to remove iron from its ores, by 1200 B.C.E. iron ore was being mixed with burning wood or charcoal and turned into hot masses from which iron metal could be "wrought" by repeated hammering. Placing the iron back in burning charcoal seemed to make it harder and stronger. The iron picked up carbon from the charcoal, especially along its surface, turning it into the hard material that has come to be known as steel. During the first millennium B.C.E. a highly superior steel product was made in India, in a region near Hyderabad. Well known for its strength and its wavy patterned surface, it was especially desirable for making sword blades. Some think that the ore found in that area just happened to have the right impurities to give the steel special properties. The hot iron was repeatedly forged and folded to produce a metal of extremely high quality that became famous all over the ancient world. It was especially sought after by Europeans, who called it "wootz"; by Moors living in Spain, who used it to make their Toledo blades; and by Arabs, who used it in their famous Damascus swords. Over the years various countries have excelled in making steel. During the eighteenth century a relatively small amount of steel was made, but Sweden was the main producer. In the nineteenth century Great Britain became dominant. In the twentieth century the United States was the largest steel producer in the world until about 1970, when it was surpassed by the Soviet Union. At the start of the twenty-first century, China led the world in steel production. Three primary installations in an integrated steel plant are the blast furnace, the steel furnaces, and the rolling mills. The blast furnace converts iron ore to pig iron; the steel furnaces convert the pig iron to steel; and the rolling mills shape the steel into sheets, slabs, or bars. The molten iron falls to the bottom of the furnace, and the limestone reacts with silicate impurities to form a molten slag, which floats on top of the iron. The two layers are drawn off separately, and the iron is poured into molds. Because the molten iron yields ingots that resemble little pigs, the product is referred to as "pig iron." Steel furnaces. 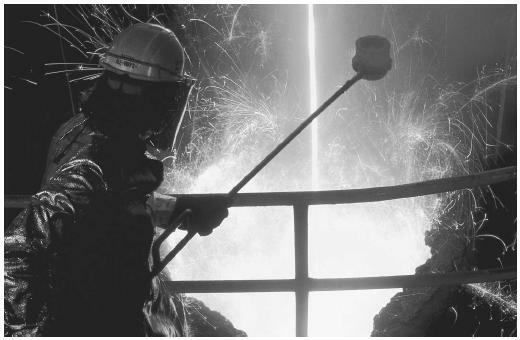 In the steel furnace, sulfur and phosphorus impurities and excess carbon are burned away, and manganese and other alloying ingredients are added. During the nineteenth century most steel was made by the Bessemer process, using big pear-shaped converters. During the first half of the twentieth century, the open hearth furnace became the main type of steel furnace. This gave way mid-century to the basic oxygen process, which used pure oxygen instead of air, cutting the process time from all day to just a few hours. In the twenty-first century, most new steel plants use electric furnaces, the most popular being the electric-arc furnace. It is cheaper to build and more efficient to operate than the basic oxygen furnace. In the electric-arc furnace a powerful electric current jumps (or arcs) between the electrodes, generating intense heat, which melts the iron scrap that is typically fed into it. The most modern process for making steel is the continuous process, which bypasses the energy requirements of the blast furnace. Instead of using coke, the iron ore is reduced by hydrogen and CO derived from natural gas. This direct reduction method is especially being used in developing countries where there are not any large steel plants already in operation. Finishing processes. A final step in processing steel is shaping. Liquid steel can be cast into ingots or various other forms. They can then be sent to rolling mills. There are hot rolling mills and cold rolling mills. Various kinds of steel slabs are rolled into sheets, strips, bars, or other kinds of products. Sometimes the steel is forged into shape with hammers or presses, or the hot steel is extruded through dies to give it some desired shape. For example, steel wire is made by drawing hot steel rods through smaller and smaller dies. Some steel is finished by grinding or polishing, and some is coated with zinc or electroplated with tin. The three top steel producers in the world are China, the United States, and Japan, in that order. The United States and Japan each produce around 100 million tons (90 million metric tons) of steel per year, and China had an output in 2000 of about 140 million tons (127 million metric tons). Iron and steel make up approximately 90 percent of all the metal produced in the world. The largest steel company in the United States is United States Steel, which produces about 20 percent of the country's steel. Carbon Steel. This is the most widely used kind of steel. Its carbon content is under 2 percent and is usually less than 1 percent. It often also contains a little manganese. Stainless Steel. This is the most corrosion-resistant kind of steel. It normally contains at least 12 percent (and sometimes up to 30 percent) chromium, and it usually also contains nickel. A very popular stainless steel formulation is 18-8, 18 percent chromium and 8 percent nickel. Alloy Steels. These contain a little carbon, and sometimes silicon, but they mainly contain added metals, such as manganese (hardness), nickel (strength), molybdenum (improved wear), tungsten (high temperature strength), chromium (corrosion resistance), and vanadium (toughness). Galvanized Steel. This steel is coated with zinc to protect against corrosion. The coating is usually done by a hot dip process. Electroplated Steel. This steel has a coating of another metal, usually tin, applied by the use of an electric current. Tin-plated steel is widely used for making cans and other containers. Tool Steel. This is very hard steel made by tempering (heating to a very high temperature and then quickly cooling). Damascus Steel. This was a very high quality ancient steel with a beautiful wavy surface pattern used in making sword blades. It seems to have come mainly from India. 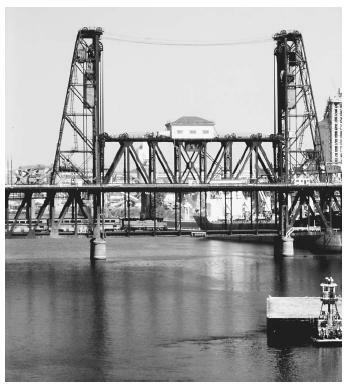 A steel bridge in Portland, Oregon. Steel's strength and resistance to corrosion make it an alloy useful for many purposes. "minimills," and they now account for about half of steel production in the United States. There were about 160 steel plants operating in the United States in 2003, and most of them were minimills. Ohashi, Nobuo (1992). "Modern Steelmaking." American Scientist November-December: 540–555. Paxton, Harry (1997). "Steel." Kirk-Othmer Encyclopedia of Chemical Technology , Vol. 22. New York: John Wiley. Pehlke, Robert D. (2002). "Steel Manufacture." McGraw-Hill Encyclopedia of Science and Technology , 19th edition, Vol. 17. New York: McGraw-Hill. Raymond, Robert (1984). Out of the Fiery Furnace: The Impact of Metals on the History of Mankind. University Park: Pennsylvania State University Press. Stwertka, Albert (1998). A Guide to the Elements. New York: Oxford University Press. This helped me a lot because I clicked on this and it was great information and I learnt a lot about steel.Here is a question is the information true or false? Good and it is useful for easy understanding of basic of steel and type of steel alloying elements.